The Society of Collision Repair Specialists’ (SCRS) has released the first of ten videos captured during the IDEAS Collide Showcase from the 2018 SEMA Show. The event was developed to create a venue for speakers willing to explore ideas worthy of consideration, and capable of conveying those ideas in a condensed timeframe of 10 minutes or less. The 2-hour program tackled topics that either highlighted industry disruption or solutions presented to the collision repair industry. This first video features Scott Ulnick, Managing Principal of DuckerFrontier, who addressed strategic insights and implications to the collision repair industry from the dynamic and rapid shift of materials type and content in North American automobiles. Join Scott as he shares where the industry is today, its evolution and what this means to you. For more information about SCRS, or to join as a member, please visit www.scrs.com, call 1-877-841-0660 or email info@scrs.com. For more information about SCRS, or to join as a member, please visit www.scrs.com, call toll free 1-877-841-0660 or email at info@scrs.com. 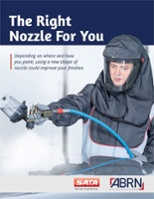 Which Nozzle Is Right For You? Depending on where and how you paint, using a new shape of nozzle could improve your finishes. This whitepaper explains new options and how to find what works for you.